O.R.L. Crosier | My Gospel Workers | "Redeeming the Time"
O. R. L. Crosier was a Millerite preacher and editor, from Canandiagua, New York. He collaborated with Hiram Edson and Dr. F. B. Hahn in publishing a small Millerite paper, theDay-Dawn. He was with Edson on the morning after the great disappointment on October 22, 1844. Edson received an inspiration from God which explained that the Millerites’ error was not in the date, but in the event; that Jesus had begun His work as High Priest in the most holy place in Heaven. Crosier, Edson, and Hahn joined together to study the subject, and Crosier was selected to write out their findings on the subject of the sanctuary and its cleansing. When Elder Bates presented the Sabbath message to a group at Edson’s, Crosier at first accepted the new light and kept the Sabbath. But eventually, he abandoned Sabbath keeping, and also his early sanctuary view. 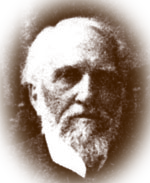 Even though Crosier made no contribution other than the development of our early views of the sanctuary, this doctrine is unique to the Seventh-day Adventist Church. The plan of salvation is perfectly typified and beautifully explained by the services carried out in the tabernacle Moses built.